We are located at 1120 Beltline Dr NE Brookahen, MS 39601 adjacent to the Hansel King Sports Complex. Please see below for our facility layout. Field 1-5 are for playing actual games and the week prior to season. 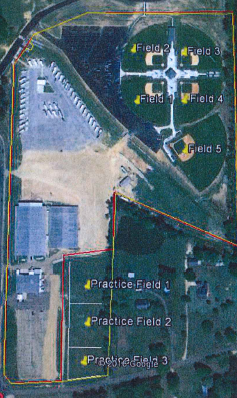 All other practices will be on the three practice fields east of the MP Building, south of the fields. Practice field 1 is for 11/12 year olds, Practice field 2 is for 9/10 year olds and Practice field 3 is for 7/8 year olds. Each field can be researved for the following week on Friday afternoons from 11-3. Please contact the main number 601-823-9064 to schedule all practices. *Each age group coaches can get together and schedule their field out for the year if all parties agree and sign request, if not you can call in on each Friday from 11-3 and researve for the following week (Sat-Friday).